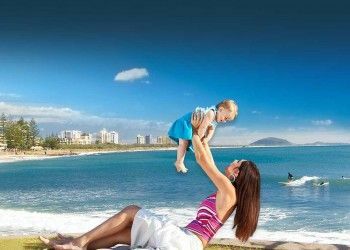 This Alexandra Headland family resort offers luxury four and a half star accommodation in the heart of the Sunshine Coast. 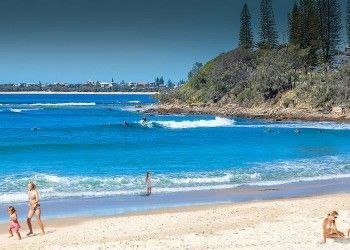 It is located on the stunning Sunshine Strip, between Mooloolaba and Maroochydore in the area that locals refer to is as “Alex.” When you stay here you will feel just like a local, enjoy the laid back, chilled out atmosphere that surrounds the whole area…aahhh instant relaxation. This Alexandra Headland resort accommodation is the place for you and your family to stay for your next Sunshine Coast holiday, you will have everything you need all within walking distance, the patrolled beach is seconds away, the restaurants, cafes, shops and bars are all just a stroll down the road. This is an excellent location for a relaxed family holiday with so much to keep all the family entertained…swim, enjoy a game of tennis, basketball, play in the adjacent park, feed the ducks or a family game of ten pin bowling….its all here at this Alexandra Headland family resort. Choose from a great range of one, two or three bedroom apartments, all are spacious and comfortable but for extreme luxury why not upgrade to a rooftop apartment. With the upgrade you will include a private rooftop with a barbeque area outdoor setting with a panoramic view of the ocean, hinterland and surrounding area. 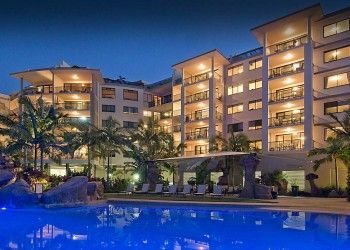 These apartments are all self-contained featuring a fully equipped kitchen, laundry facilities, two bathrooms, air conditioning, Foxtel, free internet access and complimentary tea, coffee and toiletries. Enjoy all that these Alexandra Headland apartments have to offer its treasured guests. We’ll see you soon at this Alexandra Headland Family Resort.